Last Sunday was a special time for me and my wife. This will be remembered as the first time we saw a wolf in the wild. After hearing that a wolf ( or wolves ) had been sighted in the park a few weeks back, we decided to go for a drive up to Prince Albert National Park and try our luck. The weather was on our side for Saturday, and we found some nice birds and animals but no wolf. My next update will showcase what else we saw, with a full list of highlights. We had a choice, either head for home , or try one more time to see if we can find those elusive wolves. After driving around for a bit , I suddenly spotted a little dark 'blob' in the distance. I had to look through my binoculars to see what that thing was, as it was on the top of the hill as the road went up. We eventually got up to him and he was quite unafraid, but would not stop walking, and only looked at us for a split second before plodding on down the road, occasionally glancing back. I managed a few shots through the car window as we were moving, thankfully I had set the camera up for low light. I did some reading up on this particular species, and it seems they have been known to prey on Black Bears, as well as White-tailed Deer, Beavers and Muskrats. Beautiful...thanks for taking that extra time to find one. Nice shots!! You must keep your car windows really clean :-) I'd love to see one up this close. Wonderful shots, Nick! I feel some concern that the wolf was moving slowly. Is that because it lives in a protected park? I wondered about the belly. I know it couldn't be a pregnant female at this time of year, but it looks like a large tummy. 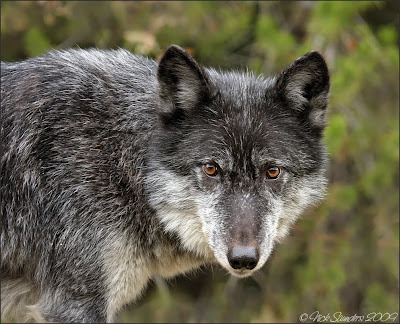 We have a wolf park here in Indiana for conservation and research on behavior. I've been there and the wolves are respected and loved -- and very lean. Through the car window? These shots are stunning. Magnificent Nick! How wonderful it must've been to see him!!! Stunning shots! It's all about patience and waiting and waiting...just like the wolf! Wow what an opportunity you got! The two last portraits are wonderful.. Something everybody would like to get on a screen!!! Just amazingly beautiful... Lokk at these eyes! Oh my gosh--you are your wife's hearts must have been beating so fast. He is gorgeous, and your detail is so sharp. I would never get to see a wolf in Cincy. 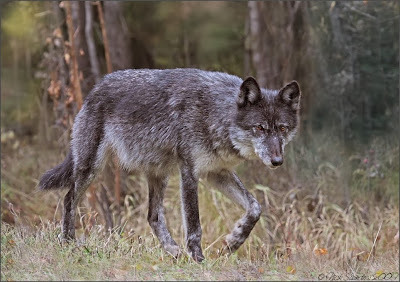 We do get coyotes, but wolves are long gone. Thanks guys. I should have wrote , "through an OPEN car window !" The windows were dirty and covered in mud , thanks to the roads. Amazing shots, Nick! and through the car window..wow. Such a special site..you lucky guy!! Given the conditions mate, these are excellent. Must have been a real thrill to see them. You are the luckiest guy...These are really nice Nick! Love the eye! 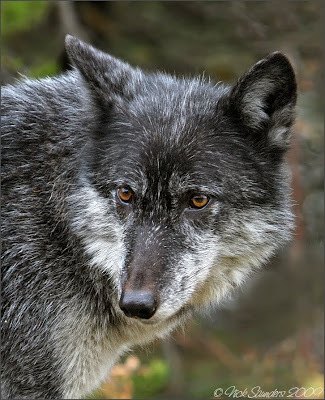 I have never seen any wolves raoming free in one of our parks. and other more remote areas. I have only seen Timber Wolves in the 'wild' in Edmonton in the dead of winter in January/February when they follow the snowshoe hares into the city from the country, when I lived there in the 70s. By keeping your distance they are very interesting to watch as they make their way. Amazing vivid shots mate! It's as if you were right in front of the wolf. I wonder what camera and lens you used. Really great. I live in the woods myself, as an australian made furnitures craftsman, and wolves sometimes wander up and about but I would never dare take a photo of one. I just can't stop staring at your pics mate.